Ten years ago, Minnesota failed to live up to its reputation for having a well-funded public school system relative to other states, as per pupil public school spending in the Gopher State dropped below the national average. While recent increases in school funding have brought per pupil spending in Minnesota once again above the U.S. average, it still lags behind the levels of the mid-1990s. …current operation expenditures, payments made by the state government on behalf of school systems, and transfers made by school systems into their own retirement funds. This classification is used only in Census Bureau education reports in an effort to provide statistics for users who wish to make interstate comparisons. The following analysis omits data for fiscal year (FY) 2009, which—according to the Minnesota Department of Education—were inflated due to the one-time authority of school districts to issue bonds to pay for “other post-employment benefits” (primarily retired employee health insurance costs). Even though retired employees did not see the vast majority of the revenue from this bond sale in 2009, the Census Bureau counted it as FY 2009 spending; therefore, FY 2009 current spending is an outlier in this data set. Minnesota used to spend more per pupil than the average state: in constant FY 2015 dollars,1 the state spent approximately $11,000 per pupil—or 6.8 percent above the national average. 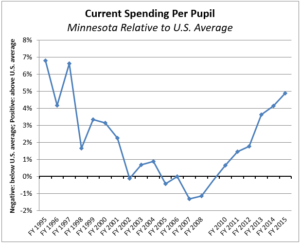 Per pupil funding in Minnesota relative to the national average fluctuated over the next ten years, but overall trended downward; by FY 2005, Minnesota’s current spending per pupil had dropped to 0.4 percent below the national average. Current spending per pupil in Minnesota dropped to just over one percent below the national average in FY 2007 and 2008. Note that the above analysis does not examine absolute spending levels in Minnesota, but rather Minnesota spending relative to the national average. The improvement in Minnesota elementary and secondary public school current spending relative to the rest of the nation from FY 2008 to FY 2015 owes more to a real (i.e., inflation-adjusted) per pupil decline in the national average than to an increase in Minnesota spending levels. While Minnesota’s per pupil current spending increased by 2.3 percent over this period, the national average fell by 3.6 percent. Nearly two-thirds of the increase in Minnesota’s per pupil spending relative to the U.S. average since FY 2008 arose from the real decline in national spending per pupil, not from the increase in Minnesota spending per pupil. A recent North Star report used information from the Minnesota Department of Education (MDE) to track Minnesota public school operating revenue per pupil since FY 2003.3 This information from MDE shows a significant decline in real per pupil operating revenue from FY 2003 to FY 2014. (This report differs from the Census Bureau information examined above in many ways,4 and is available only for Minnesota.) Significant increases in state aid—made possible through state tax increases enacted in 2013—have restored real per pupil operating revenues. By FY 2017, total operating revenue per pupil had returned to the FY 2003 level. Despite a significant increase in state assistance beginning in FY 2015, real per pupil state operating aid to Minnesota school districts in FY 2017 still trails the FY 2003 level by nearly ten percent. Significant increases in school property taxes made possible the restoration of total operating revenue to the FY 2003 level; real per pupil school property taxes in Minnesota have more than doubled since their nadir in FY 2003. The vast majority of these property tax increases occurred during the period from FY 2003 to FY 2010. Per pupil public school spending in Minnesota no longer trails the national average—as it did ten years ago—although it no longer surpasses the national average to the degree it once did. Since FY 2014, increases in state aid drove the increase in real per pupil school operating revenue, although in the longer term higher local property taxes were necessary to restore school district finances to the FY 2003 level. Minnesota’s students need continued increases in state aid to avoid more burdens on local property-tax payers and to assure adequate school funding. 1Inflation adjustments in this article are based on the Implicit Price Deflator for State and Local Government Purchases, which is the appropriate index to use when adjusting school district finances for the effects of inflation. 2Based on older information from the quinquennial Census of Governments, Minnesota’s current spending per pupil was 10.8 percent above the national average in FY 1987. 3The MDE information used in this North Star report is not available for years prior to FY 2003. 4For example, Census Bureau current spending information is based on expenditures, while the MDE information cited here is based on revenues. In addition, MDE and the Census Bureau use different pupil counts to determine per pupil amounts.